You might remember that I have mentioned my obsession with love of selvage edges from quilting fabric. I'm quite sure I will never make this but it is highly likely that at some point I will make something similar to this gorgeous quilt. And that brings me to the reason for this post. I am starting a new etsy shop. We already have One in Every Color and to this point that is where we have stocked everything we have for sale: fused glass, quilting patterns, selvage-edge pincushions. With no cohesive thread to tie them together. After reading a marketing tip that such diverse items could be confusing for the buyer and harder to brand you as a seller, I began thinking about opening another shop, just for things I sew. And since most of those things will involve incorporating selvage edges, it became important to pick a catchy name. My first choices were already taken: On the Edge (just a buyer, not a seller) and The Cutting Edge (soldered glass jewelry). One afternoon I started brainstorming with Jessie and George while they were in the hospital with Sue. They came up with a bunch of names. Some good possibilities, like Edge to Edge. George's big contribution was Bordering on Insanity. Really, George?? I quickly vetoed that name....until we were back in Sue's room visiting, and this time Mark and Jessie's fiance, Luke, were there as well. By that time I had settled on what I thought was a great name, one that I had thought up all by myself. I liked the kind of play on words, well, just one word actually. Salvaged selvages. To my amazement, everyone thought it was a boring name. Bah. Okay, guys, what do you think of George's suggestion, "Bordering on Insanity?" I asked with a snicker. Luke, who is also in marketing, said he thought it was a really interesting name. Jessie said she could definitely click on that name just to check out what kind of items the seller had. Okay, so I did an etsy name search. It was already taken!!! Unbelievable! Again, apparently just a buyer, not a seller. More brainstorming. Along the same lines as Bordering on Insanity, I came up with Selvaging My Sanity. So here is where you all come in. It's up for a vote. In one corner is Selvaged, weighing in with a lot fewer letters, straightforward. I think it could be a good contender. In the other corner, weighing in with a couple more words and a lot more letters and just under the 20-letter limit imposed by etsy is Selvaging My Sanity. What do you think? And if there are some of you who occasionally read this blog but don't usually comment, this would be a good time to come out of the woodwork and make your voices heard. You can remain anonymous but I would still love to know what your choice would be. Would a giveaway sweeten the deal? I reserve the right to make the final decision, but I'll throw a pincuchion into the ring for the comment chosen by the random number generator on Thursday at 6 p.m. PDT. And as long as we're talking selvages, look what came in the mail about a week ago. All the way from Australia. 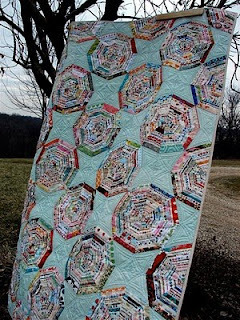 From one of my favorite inspiring quilters, Red Pepper Quilts. I have lots of product ideas. But first things first. Help me find my name. I prefer short and sweet, so Selvadged gets my vote. Besides you don't want people to think you really are on the edge of insanity, do you? Your pin cushions are darling, and I've become hooked on pin cushions lately. I'd love to win one of yours. You must sew an awful lot to end up with so many selvages! I love the name Selvadged! On Etsy, I think short and sweet is better... easier to search by seller name as well. I love Etsy and I can't wait to see how your new shop comes together! I like Selvadged. Perfect for what you are going to sell! Good luck with your decision! you knew I was going to choose the selvaging my sanity...it sooo fits those of use who choose to work with selvages. good luck with the store! Love Selvaged. Also love your pin cushions. They are so cute! And that quilt out of the selvadge pieces is so, so awesome. I like Selvadged. The other one sounds like a good blog name. I like short and sweet. "Selvaging My Sanity". Or... shorten it to "Selvaged Sanity"? I like Selvaged. Catchy and to the point. The longer name would be a bugger for those with lisps. I like Selvadged best but the other one is pretty catchy! Usually I would go for shorter but I really like Selvaging My Sanity. Makes you wonder????? sooo, what about "Pushing the Edge"
I like Salvaging My Sanity, but what about "For the Love of Salvage"? I went to school for apparel design, and our final project show (the one were the parents and the prospective employers all see the fruits of your labor) we named "Selvaged". We thought it was cool and edgy, and we had to create all of our own posters and brochures and for those we scanned each student's selvage edge and used it as a textile itself in the paper marketing. We worked so hard on it. But no one got it. There was a reporter from the Seattle Times covering the event, and it took me 20 minutes to explain it to him. Even some people who sew didn't get it right away. That's just my experience, and truthfully I would vote for that name again any day. I still think it's awesome. I like Selvadged too. I think the people who would be your market, would get the name and be drawn to it. Love those little pincushions! And how fun to get post from Australia!! Bordering on Insanity would definitely be fun and a conversation starter...but of the other two I think I like Selvadged best. Selvaged is my pick, short and sweet. And fun. Maybe Selvaged Sanity. Not quite so personal as Selvaging MY Sanity. I LOVE Selvaging My Sanity even though it's a tad bit longer. I just found your blog and I LOVE it! Thanks for sharing, keep up the great work! OK, when I saw selvadged I stupidly thought, "she's spelled it wrong" (thinking it should have been "selvedged" which I think I've seen somewhere else). That leads me to my second point, which is that there is an etsy seller called "selvedged". So I vote for something else. I like Selvaging my Sanity, I agree with the person who said she thought it would bring people in to see what it is all about. you guilted me into commenting. if i was a jokester (sp?) like mark, and if i knew anything about the computer, i'd go take one of the names just to help ya out! I think Selvaged is perfect! Simple, sweet, and kinda edgy. ELPF has a STRONG point. You dont want to be confused with someone else do you? I like Selvaging My Sanity. Selvaging My Sanity gets my vote! Good luck in your name search - I'm terrible with names! I wish I had thought of something better when I started out. Sorry I'm not much help - I like both! But I also like grandma g's suggestion of selvedged sanity. And no matter the name - your products are great! Wow, congrats on the new shop! That is exciting stuff. I vote Selvadged. It's clever, straightforward, and classy, which I really, really like. Oh my gosh, that little selvadge pincushion is absolutely adorable! I love "Selvadging my Sanity"--very clever! Selvaged gets my vote. less of a chance of someone typing in the wrong seller name. I'm going with short and sweet, too - Selvaged. People who like selvedges will know what you mean, and it will fit better on buttons and other promotional/marketing materials. I can never seem to remember how to spell it correctly, though - anyone else have that problem? I like both but feel Selvaging My Sanity is too long. What about Selvaging Sanity? I love the name Selvadged. Even if people don't know what it is, the name is short and sweet and people would probably check it out. I like Selvaged myself ... and the pincushions are pretty cute too! I usually think shorter is more memorable, but I think in case Selvaging my Sanity stands out more. Although having just tried typing that, I wasn't too sure whether "selvaging" had an "e" in it or not. If your buyers have to search for your shop by name, then you may lose some through mis-spelling! Does this mean you need selvedges? I'll save mine for you if you need them! Just let me know the width that you need (how much more past the actual selvedge label) and I'll save them for you. I kinda like "Edge Gallery." My favorite is the hybrid others have suggested "Selvadged Sanity" or "Selvadging Sanity." Alliterations are appealing and memorable. I think it will better attract attention of the uninitiated and broaden you customer base.